Haha first off sorry I've been very absent recently… having a work that requires long hours on the computer makes spending more time on the computer slightly less fun. So, why is my brain exploding? Well, first I've got the new VHD (Vampire Hunter D) novel sitting next to me right now and that always brings a smile to my face, plus two of my more obscure fandoms are coming to DVD (Mononoke: tv series and Cybersix) And that truly has me excited! 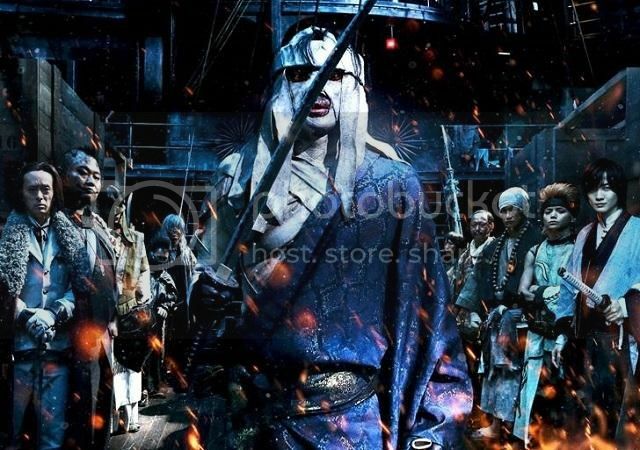 But more than that… I just found the trailer for the next live action Rurouni Kenshin movie that follows the Kyoto Fire Arch (aka the Shishio arch/the arch of awesomeness) Since I really really enjoyed the first movie, I have extremely high hopes for this one! Ok, putting the fan girl aside for a moment, some comments on the trailer from my film brain critical self. First off, just like in the first film the action scenes look totally amazing and secondly, just like the first movie, all the real life versions of the manga characters look freaking spot on. If I had any negative comments about costume design, it'd be the dangling bandages on Shishio's head, but I thought those looked silly in the manga too. I just wish they'd used some discretion and cut those off, but thats more personal choice and he still looks cool. My main concerns stem from wondering how much they're going to cram into this movie. It's clear from the trailer that Kenshin will make it down to Kyoto and at least begin the fight with Shishiou. And I say START the fight because rather like The Hobbit, Twilight and Hunger Games, the plot is going to be split up over two movies. This is a good sign to me, because other than being a cash grab, it also gives a lot of time for the long story arch to unfurl and have good pacing.